Log Home Materials – Quabbin Timber Inc.
Quabbin Timber, Inc. caters to the log home market by providing the highest quality log home timbers, framing, decking, siding, flooring and finish material. 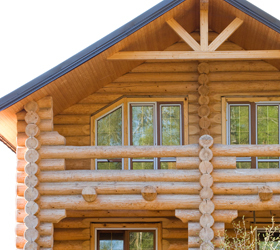 Our experience in production and supply of log cabin components allows us to handle your demands. From our inventory locations, Quabbin Timber supplies the finest Eastern White Pine timbers in the industry. We can ship green, air-dried and kiln dried timber; whichever best suits your needs. All timbers can be custom sawn to your needs. Framing and siding stock consists of 2″ X 6″ through 2″ X 12″ Eastern White Pine. We can supply rough stock, as well as milled log siding patterns to your specifications. We have the ability to ship from 2,000′ to 20 truck loads of material, wherever you need it. Please consider Quabbin Timber for all of your log home components. The Log Home industry has gone through tremendous change over the past several years. One thing has remained constant, our dedication to supplying only the highest quality products to log home manufacturers. Our roots started in the White Pine business three generations ago and our commitment remains today and for the future.